Democracy has opened doors for all South Africans. Our democratic Constitution protects the rights of everyone. Vuk’uzenzele spoke to Benny Palime from the Office on the Status of Disabled Persons (OSDP) in the Presidency, about disabled people’s rights. Palime said that in the past the majority of people with disabilities did not feel that they were part of society. They did not have political, social and economic rights. This made it very difficult for most of them to find jobs. It had negative effects on them and their families. Poor ways of giving information to disabled people. Democracy brought happiness to many disabled people, Palime said. “In the past, it was difficult for disabled people to receive certain services. 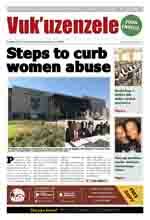 We now receive all basic services.” He said organisations working with disabled people were also happy. Disability has now been included in government’s list of important matters to attend to. This has given many disabled people hope for a better life. There are now bodies such as the Equality Court, the Human Rights Commission and the Public Protector that ensure all people’s rights are protected. Laws that ensure disabled people’s rights are protected, include the Employment Equity Act and the Labour Relations Act. 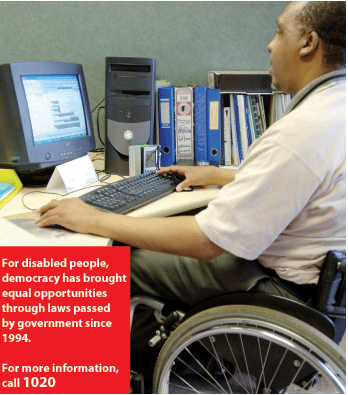 Government’s National Skills Development Strategy helps to ensure that disabled people get training in different skills. This makes it easier for them to find jobs and earn money.